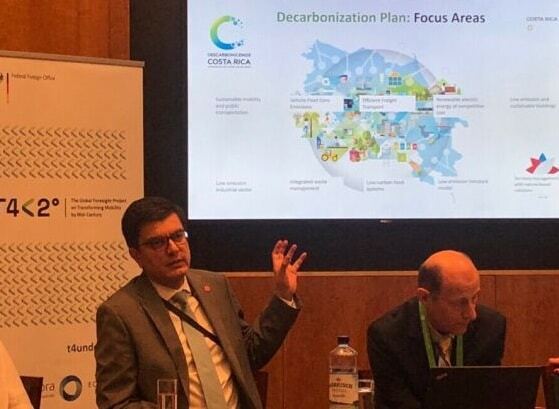 The Vice Minister of Energy of Costa Rica Rolando Castro Córdoba presented the approach to decarbonising transport of Costa Rica during this year’s Berlin Energy Transition Dialogue at the German Federal Foreign Office. He spoke at the event “Full power ahead! How to stimulate a global decarbonisation of mobility” by GIZ, Agora Verkehrswende and World Economic Forum. The Central American country has taken a leading role in achieving a green and emission-free economy since the announcement in February to fully decarbonise its economy until 2050. Costa Rica’s decarbonisation plan contains ten focus areas of which three are targeting at the transport sector, which has been identified as the sector with the highest share of greenhouse gas emissions and therefore implementing ambitious mitigation actions in transport is key. The Vice Minister of Energy emphasized that the main elements of the strategy are to change public, private and freight transport to electric in the long-term and to combine this effort with modern sustainable urban mobility. In order to realise broad electrification of the transport sector, Costa Rica has already started implementing a broad set of measures, for instance providing financial incentives which encourage drivers to buy electric vehicles. Further, a fast-charging infrastructure network will be installed all over the country until the end of the year. None the least, the government itself also contributes to the green deal: The acquisition of new government vehicles is to be carried out via a green procurement process. Overall, the foreseen measures aim at discouraging the use of private motorized transport and using public transport instead. For this reason, Cost Rica aims at improving public transport services by modernizing the transportation system. Besides starting a pilot project on electric buses, the installation of an electric passenger train for the Great Metropolitan Area, covering 73.5 kilometre of railway line, is a significant step for the transformation of the public transport system. The project MiTransporte, implemented by GIZ and funded by the International Climate Initiative (IKI) of the German Ministry for the Environment, Nature Conservation and Nuclear Safety (BMU) supports the government of Costa Rica in the sustainable transition to climate-friendly transport and thus in achieving its nationally determined contributions (NDCs) and its ambitious decarbonisation plan. The strategy of the project is to improve the legal and institutional framework for implementing the national transport and climate agenda and to support demonstration projects which make the transition visible. More information on MiTransporte can be found here: https://www.changing-transport.org/project/mitransporte/ . All in all, Costa Rica’s planned measures, activities and improvements form part of the country’s extended NDCs, which will be presented in 2020 to the UNFCCC to demonstrate and strengthen its commitment to reduce greenhouse gas emissions and participate in the global effort to fight climate change. For more information on the inter-ministerial agreement for greenhouse gas reduction in the transport sector as part of the decarbonisation commitment follow the link: https://www.changing-transport.org/costa-rica-goes-carbon-neutral-by-2050/ . The panel on the future of mobility with Vice Minister Córdoba was also the kick-off event of “T4<2° – Transport for a below two degrees future”, a project by GIZ, Agora Verkehrswende and the World Economic Forum on behalf of the Federal Foreign Office. By using Strategic Foresight methods, the project partners will develop recommendations on how to decarbonize the transport sector globally. More on T4<2°: https://www.t4under2.org/ .